William Rootes, 1st Lord Rootes (d. 1964) and by descent. The table's pillared trestles correspond to those of a rosewood sofa-table/pianoforte dated 1801 and bearing the name of John Broadwood and Sons of Golden Square, pianoforte makers to George III (P. Thornton, 'The Furnishing and Decoration of Ham House', Furniture History, 1980, fig. 193). 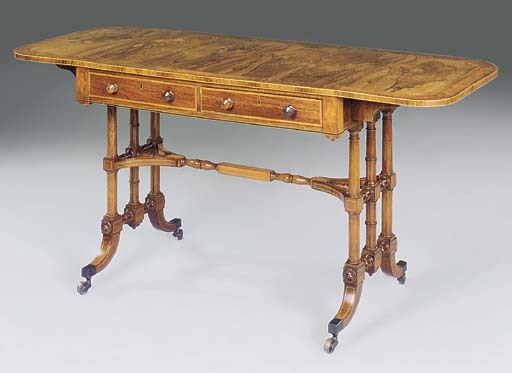 Similar tables were sold from the Mermaid House Collection, Christie's London, 12 November 1998, lot 114 and anonymously, Sotheby's, London, 29 November 2002, lot 99.